Was it deja vu? I had already seen Alexander Berardi's presentation for Spring 2011 during New York Fashion Week last month. What was I supposed to see at Heritage Court in Toronto? 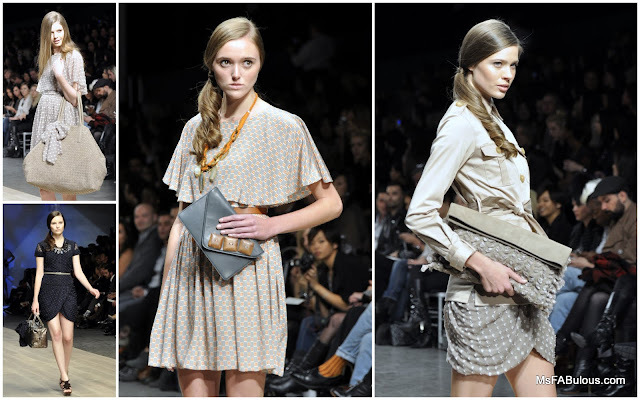 This runway show showed a tight, highly edited collection focusing on the collaboration between Canadian handbag designer Jessica Jensen with the designer of NYC. The clothing had a nautical-inspired palette of cream, navy and beige. Fabrics included Swiss dots and dainty prints. There were a few pieces with a fountain-like embroidery. The silhouettes were ladylike, but understated. The handbags included over sized carryalls, embellished envelope clutches and large hobos. The main theme of the purses was woven texture. The leathers or fabrics were woven, or other trims woven into the body of the bag as embellishment.